Ancient strategies provide a valuable link to enhance your ability to survive and prosper in modern financial markets. 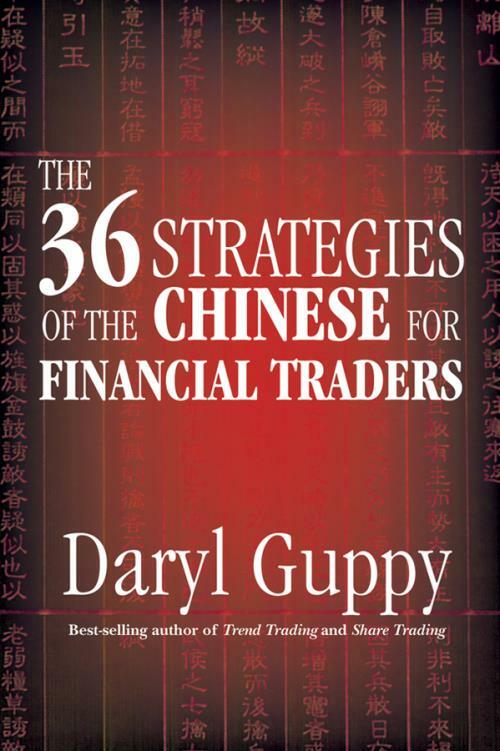 In this fascinating book, experienced trader and best–selling author Daryl Guppy explains howThe 36 Strategies of the Chinese are applied to trading financial markets. In trading there is rarely a single answer to any trading situation. The best answer, and its effective application, depends on the trader. The strategies by themselves do not guarantee success. The trader s skill in analyzing and assessing the situation determines how effective he is in selecting and applying the right strategy. This book includes specific methods for active investors and traders that are consistent with the meaning of the original ancient strategies. The 36 Strategies of the Chinese for Financial Traders follow the structure of the original 36 Strategies of the Chinese. The first 18 strategies are applied when you have the advantage –– the luxury of time and resources to examine techniques to recognize and maximize the return from these market opportunities. The second 18 strategies are applied when you are at a disadvantage –– they are strategies used against investors and traders to inhibit success. Many of the strategies are enhanced using derivatives. Part I – Advantageous Strategies. Part II – Opportunistic Strategies. Part III – Offensive Strategies. Part IV – Confusion Strategies. Part V – Deception Strategies. Part VI – Desperate Strategies.